The Great Picture is a history-making gelatin silver photograph three stories high by eleven stories wide. 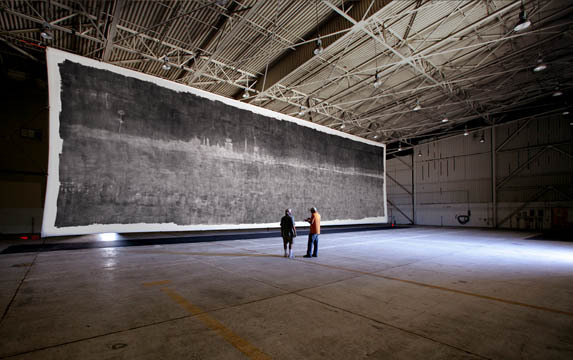 The image was made using a shuttered Southern California F-18 jet hanger transformed into an enormous camera obscura -- the largest camera ever made. The Great Picture Project artists are Jerry Burchfield, Mark Chamberlain, Jacques Garnier, Rob Johnson, Douglas McCulloh, and Clayton Spada -- The Legacy Project. This remarkable photograph is a marker of the border crossing as we move out of 170 years of film and into the era of digital dominance. The Great Picture was made using the oldest of image technologies -- a camera obscura. But within minutes of completion, the image leaped into pixel form and traveled around the globe. The Great Picture has been featured in hundreds of publications from art journals such as Art in America, Photographie, AfterImage, and Black & White Magazine to newpapers and periodicals such as the Los Angeles Times, Chicago Tribune, Der Spiegel, and The Guardian. A major book is forthcoming. The Central Academy of Fine Arts is one of the China's leading art institutions and is housed in a new building designed by Arata Isozaki, an internationally known Japanese architect.